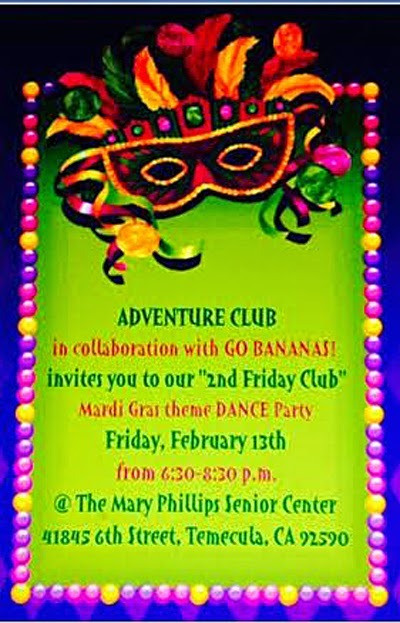 Adventure Club and the Go Bananas Teen Group is sponsoring a Mardi Gras theme dance party Friday, Feb. 13 in Temecula. The dance is for teens with disabilities. Each teen is paired with a typical peer to encourage understanding and inclusion in that struggling age range. This event is unique to the area. Most events focus solely on younger children with autism. This event is open to teens with all types of disabilities. It also gives typical teens a chance to engage with the special needs community. The event runs from 6:30-8:30 p.m. at the Mary Phillips Senior Center in Temecula. If you have questions, email gobnnas.julia@yahoo.com.